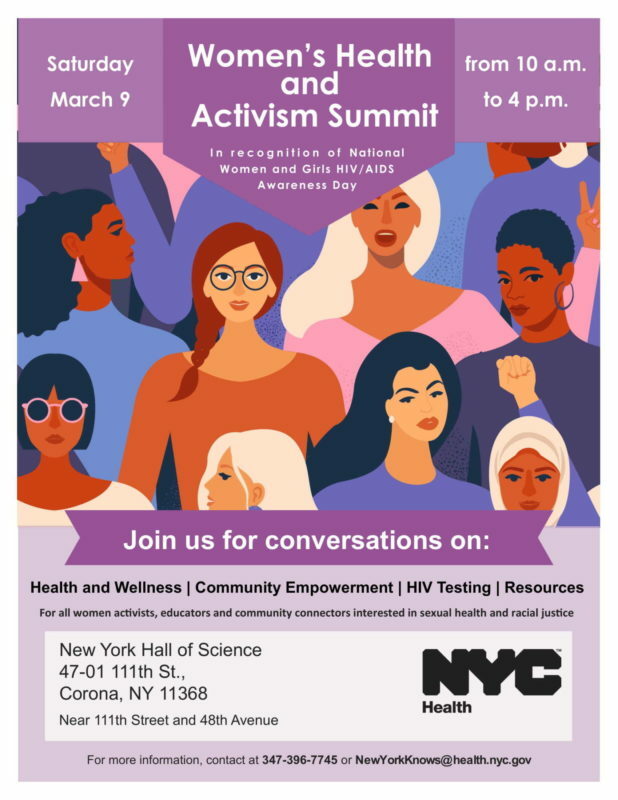 In recognition of Women’s History Month and National Women and Girls HIV/AIDS Awareness Day, the Women’s Advisory Board (WAB) and the New York City Health Department will host the third annual Women’s Health and Activism Summit on Saturday March 9, 2019, from 10 a.m. to 4 p.m. at the New York Hall of Science. The theme of this year’s Women’s Health and Activism Summit is "Unity in Diversity". The event will provide a space for women to recharge, renew, and relax, while participating in conversations and workshops on HIV, wellness, mental health, and healing. Spanish and ASL interpretation services will be available onsite. The New York Hall of Science is wheelchair accessible. Join us for a day of empowerment and fun! Please click here to RSVP. All women activists, educators, and community connectors interested in sexual health and racial justice. Women of color, cisgender women, transgender women, LGBQ+ women, and women of all faiths are encouraged to attend. Attendees are welcome to bring children to this event; however, childcare will not be provided. *Please note free activities are first come, first serve. This event will be documented through videography and photography. Entry to the venue will be considered consent to be included in the recording. If you do not wish to be recorded, please notify the staff who is checking you in at registration upon arrival.